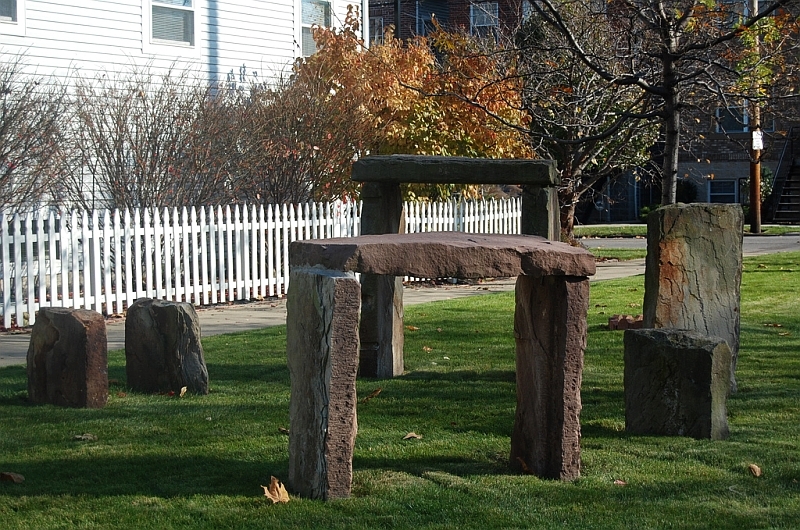 As we see it, this modest henge can’t be more than 2 miles from the Rock and Roll Hall of Fame. There is certainly a good chance it was Spinal Tap inspired. But its true importance to us is as a demonstration. How many people wonder what to do with that odd bit of green between the sidewalk and the street? (Except in Seattle where they pack them with riotous flower gardens.) Here’s the perfect answer: build a henge! Score for Tremont henge? We’ll give it 5½ druids. We thank zodar for this great find. If he or anyone else gets further information on this, like who built it, how, when or why, please let us know. Honestly, what gets into people? Note–our next entry hasa Spinal Tap connection, so stay tuned. ← Strawhenge: When You’re Ready to Bale! You’re so right, John! We have mentioned Ohio’s earthworks several times on this blog. I also photographed and wrote about the Newark Earthworks (we lived within walking distance of them when our child, now 22, was a a baby) for the website The Megalithic Portal (my name there is aluta). Thanks for the input, though. Like you, we think the Ohio mounds and their history are far less known than they deserve, and their native builders don’t get enough credit for their past. And can’t wait to see your snowhenges. Every one we’ve seen is different! Believe it or not, but Ohio has some real henges, and some wonderful earthworks. The Adena culture covered the state with sites to rival Avebury and Stonehenge. Just Google Newark Earthworks, or the Great Cirlce, Newark Ohio and you’ll get an idea… better yet, google map, and see these sites from above on the sattelite. Really something to be seen, and this year these sites, and the Great Serpent mound will become World HEritage sites.